This week marks the first of our new pages from the Stozz-Audio team with the introduction of our custom in ear monitor (CIEM) pages. All custom monitor reviews will be published to the main site as usual putting the CIEM's “in the mix” with some of the best headphones in the world but as we feel that they are a category unto themselves they will also soon be getting their own special page full of custom goodness. This dedicated section will be including reviews of the earphones themselves, comparisons, artwork and finally custom cables. To get us started on this new venture we are incredibly happy to bring to you today our review of the excellent ProGuard P2+1 precision in ear monitors. Part of the Sensorcom group (www.sensorcom.com) who offer a range of audio products for Military and police right down to musicians and bikers, Proguard have now decided to enter into the world of custom monitors to compliment there already huge selection of earplugs. 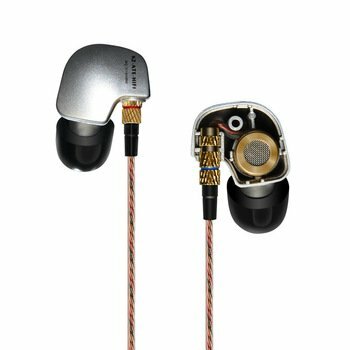 The P2+1 features a Dual driver for the lows with a single armature for the higher notes, add to that a single hand tested and matched crossover and a very reasonable price of £320 (including impressions) these are certainly one of the best bang for buck custom earphones on the market in the UK. Theres really not much in the way of accessories when it comes to CIEM's as there is no need for tips. Proguard have all the necessary bases covered here to maintain both your ears and your earphones including a tube of ear balm and a cleaning tool for removing any wax build up. Also, they include a Proguard branded leather carry case which is nice although some sort of hard carry case would be far preferred as acrylic/resin earphones tend to be quite fragile. No worries though as I am using an small pelican case to transport them as I do with all my higher end gear. They are much more functional looking rather than aesthetically design orientated pieces when compared to most competitors, just have a look at the Minerva Mi-Artist photos we have posted for something a bit more trendy. That said, you just cant beat the looks of a custom earphone. All the crazy angles and shapes that one find in the universal earphone market are nothing when compared to the shape and uniqueness of a CIEM. Each set is individual, its you after all and even after years of using customs I still find myself staring at them thinking about how amazing a human ear is, its design and function sculpted though evolution. Needless to say no set of JVC Gummies have ever made me go that deep. For my set I opted for a translucent shell with a black faceplate and there are a range of colours on offer so you can have it your way. Personally I don't go for skin tone or an all transparent faceplate as I like people to know that I have something in my ears and aren't deliberate ignoring them … or am I? The transparent base is always a nice option as I love to see the intricacies of the drivers, how they are set up, the filters and bore angles (The P2+1 is dual bore in case you were wondering). The cable is a standard 2 pin plug which comes stock with most custom monitors and remains tangle free most of the time. Yes there are nicer looking customs out there the P2+1 don't offer engravings or crazy artistic faceplate designs. Custom fit past the second bend of the ear canal with the resin filling the entire outer ear you are treated to excellent levels of isolation which makes them great for use in noisy environments as well as commuting and air travel. Only bettered in isolation levels by silicone CIEM's such as those offered by Minerva and Custom Art. Resin/Acrylic is easier to insert and remove so that whilst musicians may benefit from the extra few decibels noise reduction with silicone I find acrylic much more useable on a day to day basis. They are custom moulded for my ears. Fit and comfort just doesn’t get any better. Whats more is that Proguard are the first company to send me a set of customs that don't need any adjustments. Bravo. Sound quality is by all means excellent. It is clear and balanced with no one spectrum really dominating another bar maybe just a hint of warmth coming through from the midrange. Presentation is rather forward putting you right amongst the music rather than the feeling of observing from a distance, this is of course right in line with what a stage monitor is designed to do. Highs – Highs are crisp and clear bur never sibilant. They have very good extension as you would expect from a having a separate balanced armature handling the upper frequencies. Mids – Mids are very clear and detailed sounding with vocals shining to compete with even the highest end universal monitors. Diana Krall and Gina Kranis both sounded amazing through the P2+1 and it was a pleasure to listen to whilst sitting back and relaxing. Switching over to some rock ballads and its much of the same with guitars vocals sounding exactly as they should. Mids and lows are the strongpoints here and certainly manage to keep up with similarly priced universals. Lows – Lows for a BA driver are actually delivered with good weight. I would go as far as to say that barring the Final Audio FI-BA-SS they offer some top end bass performance for a moving iron driver. Good punch clarity and extension are all there and it is very very hard to find fault. I really enjoyed the sound from the P2+1 it offers to me it sounding like a far sharpened up faster Shure se215 with regards to its tuning but is far more capable in regards of speed and clarity etc. Proguard have not traditionally been targeting audio enthusiast like us in recent years but they do now look set to become more involved in the market. The P2+1 does so much right its very hard to fault. The only thing we would really like to see would be a modernisation of the packaging, a hard case and some fancier faceplate options. Sound is excellent of course as is comfort and if I was faced with choosing these or even higher end universals id take the P2+1 every time. You can find more information on how to order the Proguard P2+1 custom in ear monitors direct from the Proguard Audio website.